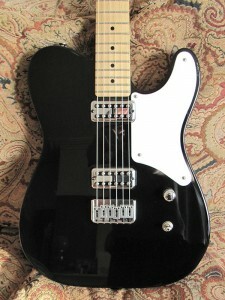 The La Cabronita model introduced by Fender in August has been quite a hit, which is no surprise. A very cool looking and sounding guitar that a lot of players have been lusting after for a while. However there are a few things that can be done to improve it for minimal outlay. I’ve already posted about fitting the capacitor circuit from the Custom Shop models here. Another easy mod is to swap the bridge. 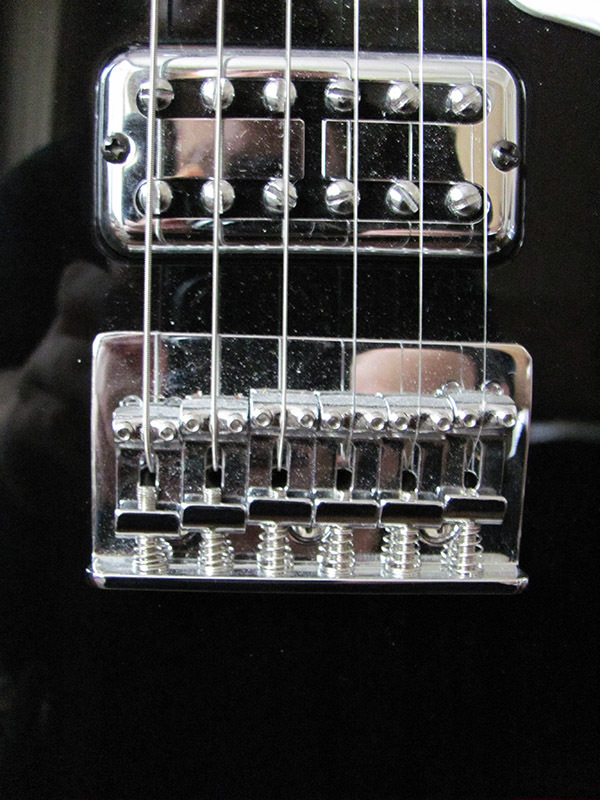 For some reason Fender have fitted a bridge with 2 1/8″ / 54mm string spacing, which is not how either the Custom Shop or Telebration models come. They both have the American Standard Hardtail Stratocaster bridge fitted, which has 2 1/16″ / 52.38mm spacing. 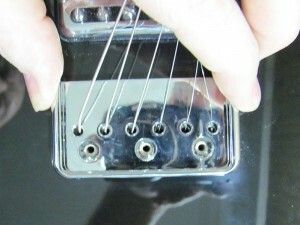 Even stranger, it seems that Fender have actually drilled the body for the American Standard bridge string holes/spacing and just fitted a different bridge – the string-though holes are a little oversized, which makes them compatible with both bridges. 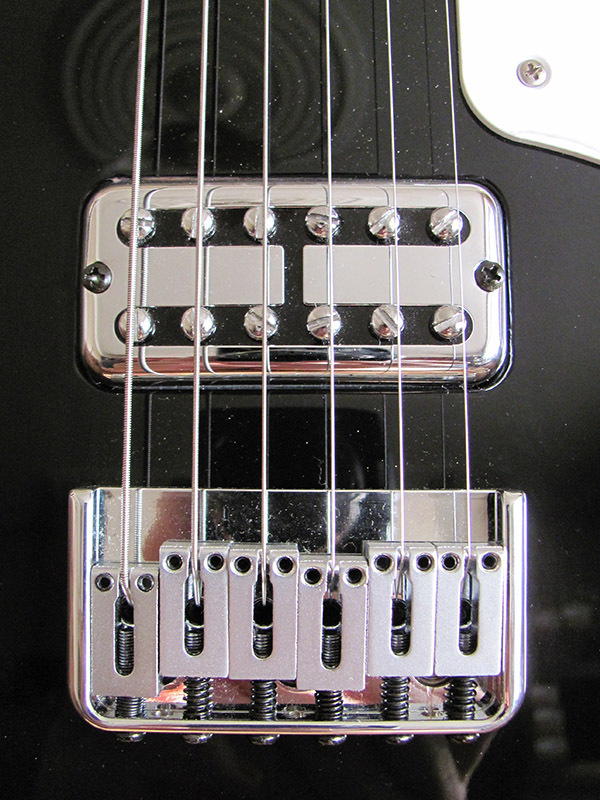 However, the wider spacing does not allow the strings to travel over the centre of the bridge pickup poles (see first picture). How much this actually matters is up for debate – I doubt anyone could actually hear the difference between centred and off centre strings. Cosmetically it looks a little naff though. Fitting a US Standard bridge requires angling the outer mount screws to get them to use the current holes. They are also fairly pricey, and I’m not a big fan of the offset saddles on the US Std bridge. Luckily I stock a very nice drop in replacement bridge! Our Hipshot style hardtail bridge – a high quality solid bit of kit. It’s also a direct retrofit for the La Cabronita bridge. No messing around angling screws, the mounting screw holes are a perfect match. It was while doing this mod that I noticed that the bridge on my La Cabronita was very slightly off centre – nearer the neck on the bass side. You can see it in the first photo. I didn’t want to mess around with filling and redrilling the holes to get it perfect (I bought this guitar knowing it had a couple of cosmetic flaws), so just fitted the new bridge. This is why the B/E strings are not centred over the poles, but you can see they are a marked improvement over the stock guitar. I’m very happy with the mod – cosmetically I think the new bridge is a looker, and in use I much prefer having the raised sides on which to rest the side of my hand. The height adjustment screws in the block saddles don’t dig in to my palm, either. I’ll be fitting the capacitor circuit next – just waiting for a hardware shipment to arrive with push/push pots. This entry was posted in Fender La Cabronita Modifications and tagged Axecaster, Fender, Hardware, La Cabronita, mods, S1 switch, Telecaster. Bookmark the permalink. 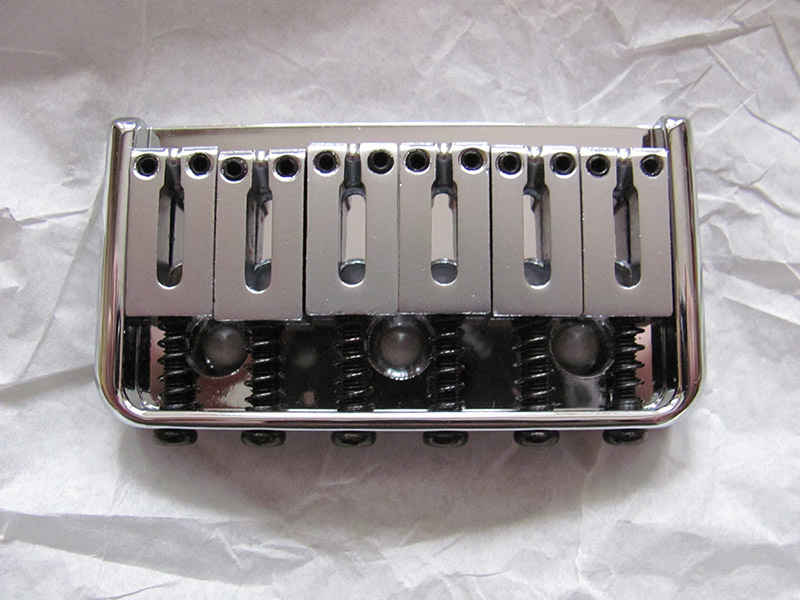 Hi, I’m about to order the hipshot style fixed bridge. Can you confirm the spacing between the fixing holes please… 21mm? The distance between the centres of the outside holes is 44.25mm and the distance between the centres of each adjacent hole is 22.15mm (measured with digital callipers). Yes, thanks for that. I’ll be ordering in next day or so. Does swapping from the original MIM Cabronita bridge to the Hipshot bridge improve on the distance of the high “E” string to the closeness of the neck edge as well? 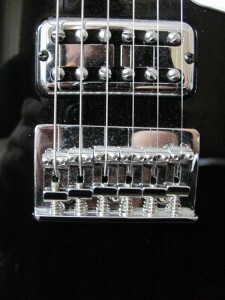 With the stock bridge mine is uncomfortably close to the edge and easy to pull off the fretboard. I really like that the mounting holes on your Hipshot bridge match up the the original mounting holes. Thanks! The strings on my La Cabronita did not suffer from being too close to the edge of the neck. Narrowing the string spacing at the bridge (as this mod does) can help with that at the bridge end of the fretboard. If they are too near at the nut end I think a new nut with better spacing would be needed. I have changed my bridge and it is a great improvement. I am keen on pearl button tuners, can you recommend appropriately sized replacements please as I don’t really want to red rill etc. The peghead hole size for these would be 10mm. I’m not sure which replacements will be a direct fit I’m afraid. 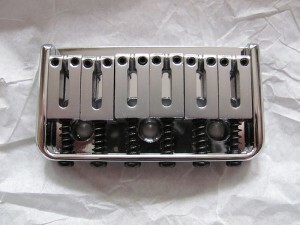 Encouraged by your comments in this Blog I changed the Standard cabronita MX Bridge with your Hipshot Bridge. It was no Problem at all. The String spacing is better, and I think the Sound has improved because of the massive style of your Bridge, and it Looks Way better…….. Thanks for the feedback Gerhard – it’s always great to hear back from customers. 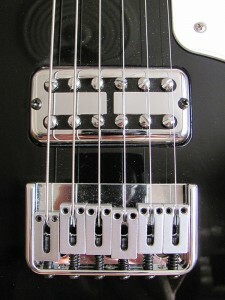 Would this bridge fit a Squier Cabronita Tele by any chance? I’m afraid I don ‘t know – looking at the pictures the string spacing appears to be correct, however the mount holes are definitely different. I am unsure if the original holes would interfere with the new holes that would need to be drilled. I’m looking for someone to confirm it for me! Sounds like I may have to be the guinea-pig on this! New batch due in the next day or two…I’ll let you know when they are here! No stock of Hipshot bridges, oh no. Are you expecting more in? I have a rush order being prepared now (they didn’t arrive on the the last shipment) so I’m expecting them in a couple of weeks. Hi, I was wondering if you knew if this kind of fix would work on the Thinline series of the Cabronita? I would expect so, but just want some form of reassurance. I have a couple of blog posts about the compatibility with the Thinline model here and here with pics of customer guitars with the change. I really love this bridge! Any chance it’s available in black too? ???? Sorry for the late response. I’m afraid I don’t carry any black hardware, sorry. I have a batch on order which will arrive hopefully mid-Feb. I have a few B-stock left. They have minor plating blemishes.